Fishing has been a popular and beloved pastime and way of life for countless Americans for many years. The U.S. boasts some of the biggest freshwater sources on the planet, as well as enjoying countless rivers and bays, along with the world's two biggest oceans on either side. If you're looking for a super fishing spot along the East Coast, Chesapeake Bay is a prime location, known the world over for the diversity and quality of its fish, as well as its beautiful waters and gorgeous surrounding scenery. Part of what makes Chesapeake Bay such a super fishing spot is that it offers great action all year long. No matter what season you set out, you're guaranteed to find some big fish. Striped bass migrate in and out of the area over the course of the year, while flounder and other species also take up home in the Bay during certain seasons. There are always lots of fish just waiting to be plucked from the waters, and there's rarely a day of the year that goes by where Chesapeake Bay isn't filled with anglers in search of their next big catch. If you’re an inexperienced angler, various fishing charters can be found in the area with friendly, trained captains just waiting to help you land some big fish, and you don’t even necessarily need a vessel to enjoy Chesapeake Bay fishing as there are plenty of good shoreline spots to cast a rod and see what you find. What Sort of Fish Can You Find in Chesapeake Bay? There are many different fish species to find all around the Chesapeake Bay area. The biggest targets include striped bass, red drum, black drum, bluefish, cobia, flounder, and tautog, among others. Let's take a closer look at some of these species, where to find them and what times of year they can be caught in Chesapeake Bay. One of the most popular and prized fish in the whole of Chesapeake Bay, the Striped Bass, also known as striper or rock, can weigh over 100 pounds and have an average length between 70 and 100cm, but can grow much longer than that in some cases. The striped bass tend to spend spring time spawning in the tributaries around Virginia and Maryland before heading out to the Bay around May/June time. They're one of the tastiest fish in the whole Chesapeake Bay area and are a popular target for fishing charters. Red Drum, also known as channel bass or red, can often be found in the same areas at the same times of the year as their close relatives, the black drum, known commonly as drum. These fish are most commonly found around spring and fall time in Chesapeake Bay but can be found at other times of the year too. They're a highly common catch and can grow up to huge lengths, making for some very impressive trophies. Both red and black drum tend to spend much of their time around the shoals of the lower bay and can regularly be spotted swimming around near the surface of the water. A highly prized fish among expert anglers, Cobia can really put up a big fight and are one of the biggest fish found in the Chesapeake Bay area. These fish can weigh in at over 100 pounds in some cases and it can a true thrill to reel one in. Cobia tend to show up around the Bay in May and hang around for the warm summer months. They are often located around the Hampton beaches and have also been frequently spotted at Bluefish Rock. 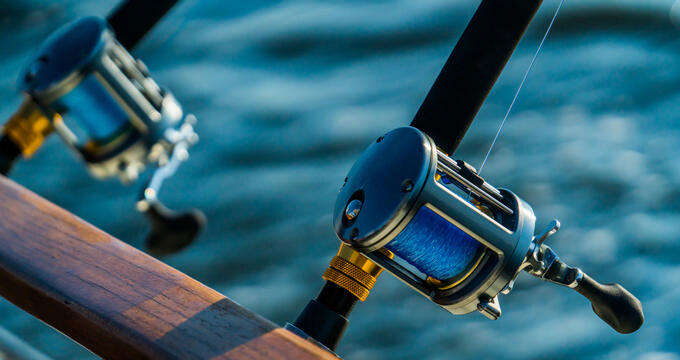 Chum needs to be a key part of your angling arsenal if you're hoping to catch some cobia, and you'll need a lot of patience, strength, and endurance to wear them down and reel them in once they take the bait. Very common all around the Bay, especially during the summer months, Flounder are a highly popular fishing target. These huge flatfish can be very tasty to eat and a lot of fun to simply catch and release too. They tend to start appearing in large quantities around Chesapeake Bay in late May or early June as they enjoy the warm waters, but spend a lot of their time quite deep below the surface. Flounder also like to hide in various crevices and find shadowy spots, so are often spotted around the Chesapeake Bay Bridge Tunnel, as well as hanging out around inlets, rockpiles, channel edges, wrecks, and more.